Airbus took one big leap toward bringing a flying taxi to the public, flying its prototype Vahana aircraft for the first time. Airbus said its full-scale aircraft made two short flights on Wednesday. The self-piloted aircraft climbed 16 feet before successfully returning to the ground after the 53 second trip. The Vahana flew again on Thursday, the company said in a statement. The test flights took place at the Pendleton Unmanned Aerial Systems Range in Oregon. The 20.3 foot-long and 18.7-foot wide Vahana is designed to take off and land vertically in a small area. It has helicopter-like struts, and two sets of tilting wings each with four electric motors. There's room for a passenger under a canopy that retracts like a motorcycle helmet visor. The project is part of Airbus's expansion into new flying technologies through its silicon valley unit, A3 (pronounced A-cubed). 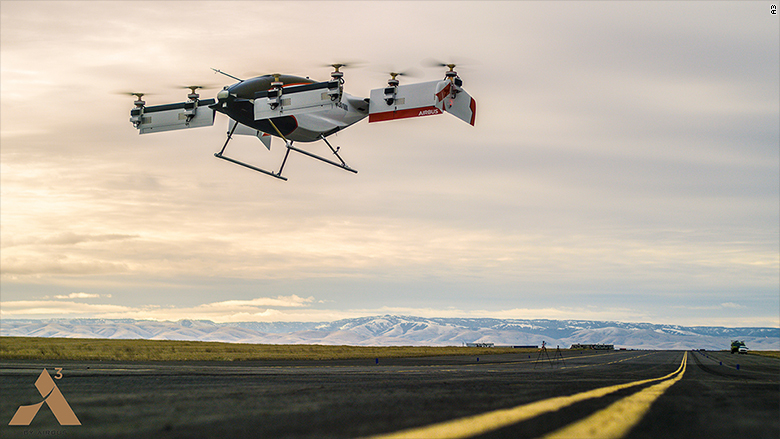 Airbus's Vahana makes its first flight on January 31, 2018 at the Pendleton UAS range in Oregon. Unlike the slow and years-long process of designing, building and testing Airbus's airliners, Vahana's first flight comes just 24 months after A3 's founding. "In just under two years, Vahana took a concept sketch on a napkin and built a full-scale, self-piloted aircraft that has successfully completed its first flight," said Zach Lovering, project executive of Vahana. Future tests will further validate the company's technology and the prototype will eventually test the transition from hovering a few feet off the ground to forward flight. Vahana has to master that transition if it wants to fly passengers from the rooftops of skyscrapers in crowded cities. Vahana executives have said they hope to have a more refined version of Vahana ready to sell in 2020. "Our goal is to democratize personal flight by leveraging the latest technologies such as electric propulsion, energy storage, and machine vision," said Lovering in a Medium Post about the first flights. Uber's Elevate project cited the Vahana project as a possible candidate to move the company beyond ground transportation and transform how people get around cities. Airbus's chief rival, Boeing, is also rapidly advancing technology for future air taxis. The aerospace giant last year acquired Aurora Flight Sciences, a maker of automated drones and aviation parts.